It was like a night at the museum. 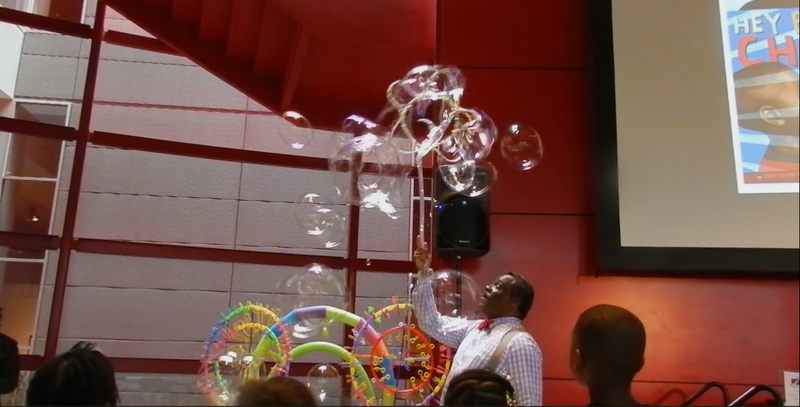 Angelo and Marie's Fantastic Bubble Show performance at the Reginald F. Lewis Museum. Children immersed themselves in an enchanting world of wonder created by Mark Angelo and Brenda Marie. Introducing "Angelo and Marie's Liquid Art and Light Show"
Their newest show features a musical story about a young man and his wife who discovered "Living Water". A liquid capable of defying gravity, absorbing and refracting light and taking on the form of liquid art at The Liquid Art and Light Show! Be amazed as you watch liquid art in suspended animation filling the theater with the beauty of floating gems, blown glass, crystal chandeliers and other art forms. Behold the KIB phenomenon! Feast your eyes on the amazing feat of putting Kids Inside Bubbles. We transform your school's recreation room, auditorium, and stage into an imagination emporium that brings sweet dreams to life. Watch our channel of bubble show tours at https://www.youtube.com/c/MarkAngeloAskew or go to http://bubbleshow.fimark.net for more show and booking details.